The hotel La Bourdonnais, 4 stars boutique-hotel, makes you discover the Traveller’s Art of Living. Modern and warm, our establishment propose you a unique journey where elegance, charm and refinement will be the key-words all your day long.To make you live an unforgettable experience, our decoration is inspired from the story of Bertrand-François Mahé de la Bourdonnais, Lieutenant of the French East India Company, who went to the conquest of new horizons. This is the spirit of the discovery which animates our boutique-hotel where adventure lovers, enamoured of freedom or passionate of exploration will meet up. We invite you to make beautiful discoveries in our curiosities library and hence, meet the traveler’s accessories. Pursue your expedition in our warm rooms and suites where muted colors and exotics perfumes combine themselves. An authentic expedition for a travel in the heart of the capital. There is nothing more pleasant and comfortable for your events than an open-sky meeting room. 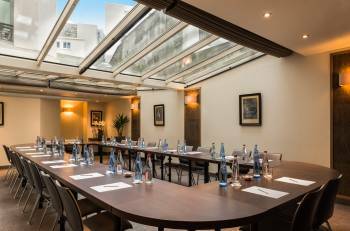 In a single framework, in the heart of Paris, the seminar room of hotel La Bourdonnais offer you 40 seatings, thus all the necessary equipment for the well realization of your event. The hotel La Bourdonnais propose you a meeting room, but also all the know-how and know-how-to-be of all its team that will make the success of your private or professional events.Breakfast :Including meeting room, paperboard and screen. Warm drinks, a selection of viennoiseries and fresh fruits basket. Free WiFi.Study Day :Including meeting room, paperboard and projector. Welcome coffee, two breaks. Seating lunch or vuffet and personalized menu. Free WiFi.Half-day Study :Including meeting room, paperboard and projector. Coffee break and free WifFi insured.Coktails and After-work :Cocktail Bar, Champagne. Selection of salted canapés and gourmet plates. Privatisation of salon.Business Diner :Including meeting room, three dishes menu and drinks. Champagne glass and mignardises.